OK, so it's a lousy picture of a pretty frog abandoning the premises. I probably had a chance to get a good picture of a pretty frog on a log, but I was a good citizen and told my fellow travellers to come and see the pretty frog instead of setting up for a good photo. We visited Costa Rica at the end of the dry season, which is probably the worst time of year to find frogs. We were lucky to see this guy, who was out and about after a mid-day shower. 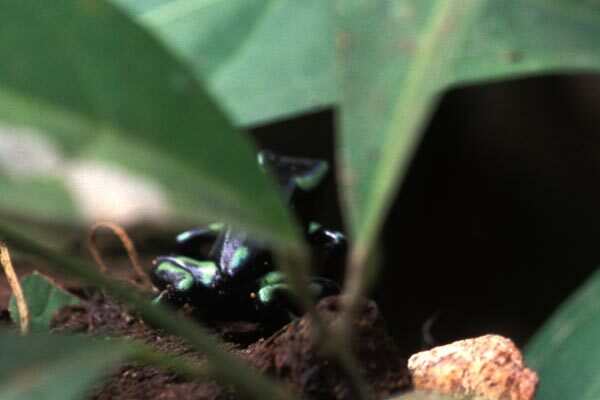 There are many species of "poison dart frogs" in the New World tropics. They generally have toxic skin secretions and bright colors with which to warn the predators about the toxic skin secretions. A few species (probably only 1 or 2) were used by the native people of Colombia to supply poison for their blowgun darts. Most of the frogs called "poison dart frogs" have much less potent toxin, and were not used to make darts, including this species. 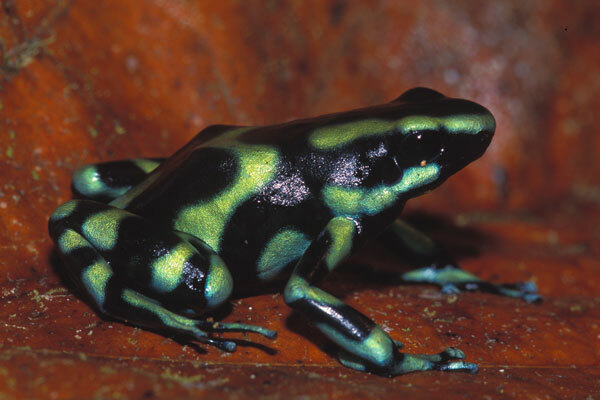 Still, "poison dart frog" is a much more exciting name than "unpleasant-tasting frog". Alejandro Solorzano of the Costa Rica National Serpentarium found this beauty going about its business in the rainforest. We brought it back to the lodge where we were staying and we took photos that afternoon before releasing it. Here is a complete list of the species we found on this GreenTracks trip.